The Summerlin Patriotic Parade winds its way along Hillpointe Road and Hills Center Drive. Photo Courtesy Summerlin Council. If you’re looking for ideas on how to celebrate the holiday, see Pages 16-17 of the July Link. From the Summerlin Patriotic Parade happening across Lake Mead Boulevard to the 70th Annual Boulder City Damboree, the Link’s got you covered with all the important information. SCSCAI’s administration offices are closed in observance of the holiday. For exact hours and telephone numbers of all other departments, see Page 6 of the Link. Tavern at the Falls at Highland Falls Golf Course open 6 a.m. to 8 p.m. The Summit will be open for the Fourth of July Feast, 6-9 p.m. Dinner reservations are sold out. Due to popular demand, the Community Preparedness Committee will repeat the highly attended water and gas safety class on Tuesday, July 10, 10 a.m., at Desert Vista Community Center. In Sun City, the primary water line to a residence is located beneath the concrete in front of the property. To learn how to stop a water leak and what tools to use, CPC volunteers have created a class that shows residents exactly how to manage emergencies until designated responders arrive. Each guest will be offered hands-on experience in shutting off a water valve. So that adequate seating and refreshments are available, let us know to expect you. 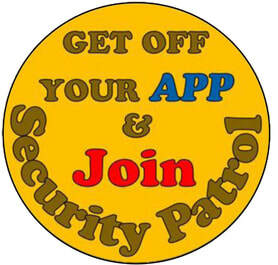 Email your RSVP to neighborhoodwatchsuncity@gmail.com, or leave a telephone message at 702-658-4486. The project for the front 9 irrigation project at Palm Valley Golf Course has begun. The contractor is installing the new mainline. The ground is rocky and hard to dig, so things are moving a little slower than originally anticipated. The contractor is working on getting a different type of trencher to hopefully speed things along. Hole No. 1 is completed with the new mainline installed and crew members now working behind the green. There have been several questions from residents about the different sizes and colors of pipe being used in this project, so I thought I’d try and provide a simple answer: The large, light blue pipe is the mainline. This pipe will provide the main supply of water throughout the course. The smaller purple-colored pipe will be the new lateral lines that supply water to the sprinkler heads. The black pipe is called HDPE, and it is the pipe that will go underneath the road crossings. The contractor is going to install the entire mainline first and then install the lateral lines for each hole after that. Thank you for your patience while we are under construction. As previously reported, on Wednesday, June 27, 2018, the Sun City Summerlin Board of Directors by a vote of 7 to 1 approved a tenant and lease for the Palm Valley Restaurant. Following is some information about the tenant, and the estimated timeline to open the restaurant. • The new tenant is Randy Miller. The legal name of his company is Millers Tavern, LLC. • The name of the restaurant will be Miller’s Tavern at Palm Valley. • Randy was born and raised in Las Vegas and is the third generation of his family to call Las Vegas home. • Randy attended college at the University of Nevada in Reno. • Randy was a Las Vegas Metro Police Officer (following in his father’s footsteps) for 8 years. • Randy is one of the three partners in all of the Molly’s restaurants, taverns, and casinos, as well as the Stonehouse Tavern and Foothills Tavern. • Randy has golfed at Sun City Summerlin for years, and has been interested in the Palm Valley Restaurant for the last 12 months and has many ideas to combine a breakfast menu, sports menu and dinner menu that will appeal to the residents as well as those who golf. He sees an opportunity to create a place where residents come to eat, sit and visit. • The restaurant will have food, liquor, and gambling. While everyone is anxious for the restaurant to open, there are some things that have to happen first. Using today, June 29, 2018, as the starting date, the following is the estimated timeline. 1-21 days – Las Vegas City Council will vote to transfer the Palm Valley Restaurant liquor license back to Sun City Summerlin Community Association, Inc. from the previous tenant. Tenant applies for a Gaming license for this location. 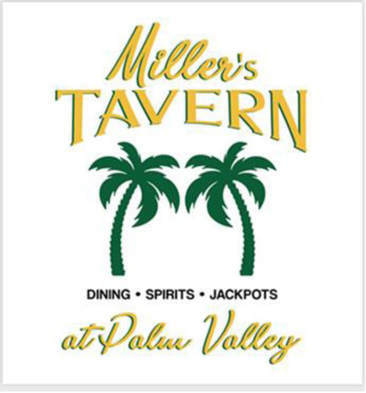 22 - 66 days - Las Vegas City Council will vote to transfer the Palm Valley Liquor license from Sun City Summerlin Community Association, Inc. to Millers Tavern, LLC dba Miller's Tavern at Palm Valley. 66 – 74 days – Restaurant prep, stocking of food and beverages, final inspections. Day 185 – Gaming license approved-slots installed. So to recap, if everything goes perfectly! On or around September 12, 2018, open for food and beverage. On or around December 31, 2018, slots installed. I know some of you will wonder why Sun City Summerlin Community Association, Inc. keeps the liquor license and only transfers it to the tenants. In Las Vegas, there are a limited number of liquor licenses and they are very valuable. It is good business for us to keep the license that was issued to Palm Valley restaurant when it was operated by the Association. It is common practice for the license ownership to stay with the original purchaser and then be transferred and held in escrow while there is a tenant at the location. The license is transferred by the State of Nevada in order to meet licensing requirements and put the license in the name of the tenant and protect the Association. You may also wonder why it will take so long to get a gaming license when our tenant already has numerous locations with gaming. The State of Nevada treats each location and application separately and they are investigated and processed in the order they are received without exception. I will continue to provide updates to keep you posted. 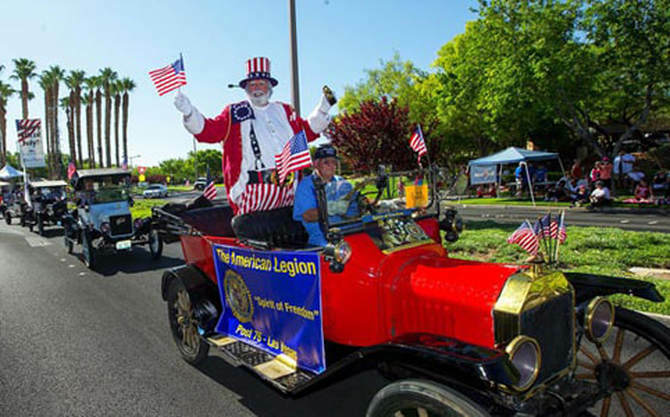 The Summerlin Patriotic Parade gets underway across Lake Mead Boulevard at 9 a.m. on Wednesday, July 4. Stake out a seat along the parade route with a blanket and/or folding chairs. Photo courtesy Summerlin Council.